But for more than a decade, special teams have been anything but special in the Madden NFL series. Field goals were near automatic. CPU punters would routinely blast punts through the back of the end zone. And you want to try to block a kick? Forget it, it wasn’t happening. Madden NFL 17 promised a retooling of most aspects of special teams gameplay. A new kick meter was introduced, new trick plays were added, and a new mechanism for blocking punts and field goals was brought into the mix. While the long overdue refresh finally adds excitement and strategy to special teams play, there is still plenty of opportunity in future additions to make additional improvements that can make mastering kickers, punters and returners as important to success as it is on Sundays. 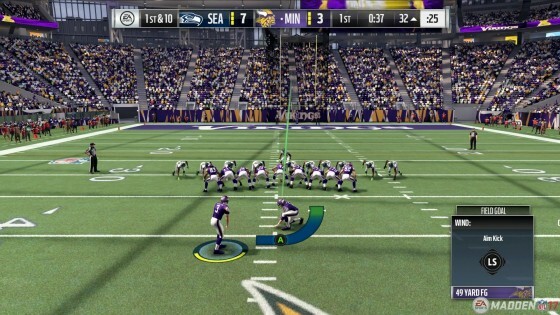 Madden NFL 16’s kicking system was as easy as it was familiar: nudge the direction arrow left and right to aim, pull back on the right stick to start the meter, and push up on the right stick when the meter was full. After a few kicks, most users could time the power meter without issue, and because the horizontal accuracy of the right stick input was rather forgiving, players could nail the vast majority of their field goal attempts with ease. 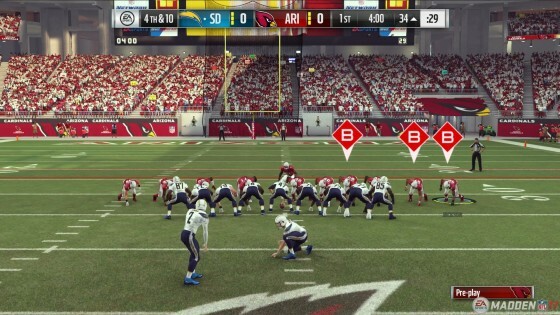 Citing a review of game tape from the 2015 NFL season, EA set out to make field goals less automatic for this year’s iteration. This led to the introduction of a new kicking meter, one that utilizes a “three-button” method that anyone who has played a baseball or golf game since the 1990s should recognize. The new mechanic will cause some misses as the user learns the timing for each stage of the kick meter, but after a few minutes of practice, the meter provides only a slightly beefier challenge than that of the old system. The new meter does add an area in the power portion that extends beyond the ideal (marked with two triangles). This simulates “overswinging” and not connecting cleanly with the kick. The punting mechanics provide a few new options. “Sky” punt gives one-button access to instruct the punter to go for max hang time, minimizing the opportunity for a return. The “backspin” option makes punts check up and come back towards the line of scrimmage when they land — useful for pinning the offense near the goal line. Unfortunately, much like the previous versions of the game, this new meter is fairly forgiving in the accuracy setting portion of the mechanic, meaning poor punts and shanks will be few and far between, even with some of the lowest-rated punters in the game. The difference between Pat McAfee and Adam Podlesh is tough to discern. This means most players will choose punters based solely on their kicking power attribute in order to squeeze out a few extra yards per punt. Skills such as speed of getting off a punt, coffin corner frequency, hang time, etc. are not well reflected yet in the game, making every punter perform about the same as any other. After years of selecting plays named “FG Block” on defense and knowing there was absolutely no hope of such a thing occurring, Madden 17 has implemented a block mechanism for both punts and field goals that gives players who execute the proper timing a chance to break through the line and smother a kick. This threat has finally given users a reason to select the conservative (and previously useless) “Punt Protect” package to help prevent a blocked punt. On the opposite end, the defensive team is forced to decide whether to go for a block or hold back extra blockers and set up a return. The threat of picking up a roughing the kicker penalty on a block attempt gone awry will also need to be accounted for by players. The days of mindlessly selecting “Punt Normal” and “Return Middle” on punts are over. Early impressions of the new mechanic seem to indicate that blocked kicks and punts are occurring slightly more often than we see in the real NFL. Whether this was a conscious design decision that is working as intended, or something that will be tuned down in the future remains to be seen. Also contributing to the strategy that now plays a part in special teams’ play-call decisions are the suite of new trick plays available out of field goal and punt formations. The new plays reflect more creativity than the old “Fake Pass” and “Fake Run” options from past iterations. There are shovel passes to the end blockers, behind the shoulder flips to the kicker for a roll out pass, direct snaps to the personal protector on punts and more. These plays add a flair for the dramatic, but also serve the practical purpose of punishing players who go for all-out blocks on every field goal and punt. Each one can be effective if executed properly. Punt and kickoff returns were one aspect of special teams that didn’t get polished in Madden NFL 17. The blocking and running lanes are not representative of how the real deal works, and there is very little variety in how returns develop. This is disappointing, but because any misstep here can cause a potentially game-breaking imbalance, perhaps it was best to set this aside until it can be given the proper resources it needs for a total overhaul. Overall, it was great to see special teams get some love after years and years of boring, mindless mechanics that failed to represent the excitement and importance that the “third phase” of the game brings to the table. While there is still work to be done in this aspect, players finally have the ability to make consequential special teams decisions and plays in Madden NFL 17.